I grew up on Oahu and spent many of my best school vacations camping at a beach house with my family and family friends. Back in those days the beach house wasn't locked and the kids were free to come and go at all hours of the day. My favorite thing to do was wake up at dawn (gosh, I haven't done that for years....I'm more likely to be going to bed at dawn these days) and walk up and down the shore looking for whatever gifts the ocean had left for me. At the end of the family vacation I always returned home with a mayonaise jar full of shells, unusual rocks/coral and the prized frosted sea glass in the colors of the ocean. I still love the look of sea glass and wish I had kept the bottles of beach treasures. To celebrate the memory of my childhood I decided to create a sea glass necklace. This necklace is very easy to make. The hardest part was finding just the right pieces of glass. I purchased a bag of tumbled glass (for mosaic) since a didn't have any real sea glass. Each piece for this necklace was wire wrapped with 26 or 28 ga sterling silver wire. Jump rings were used to link the wrapped glass together and to attach them to the the bail. The rest of the necklace is made by stringing 'new' jade chips on beading wire and adding a clasp. I'm not sure what 'new' jade is but it matches well with the frosted look of the sea glass. 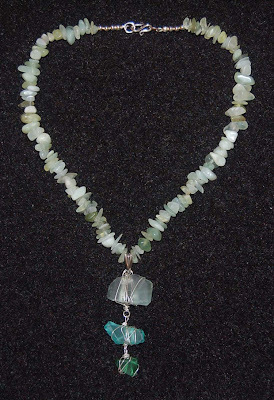 I bought the strand of semi-precious 'new jade' gemstone from Ben Franklin Crafts. Sometimes the store has other strands that look similar but have a different name. I gave this necklace to my sister for her birthday because I know she loves sea glass as much as I do. Today is my birthday so I need to make one for me, too. Why don't you try to create a found-object necklace for yourself? It will be a memory to wear around your neck and will surely start a conversation. 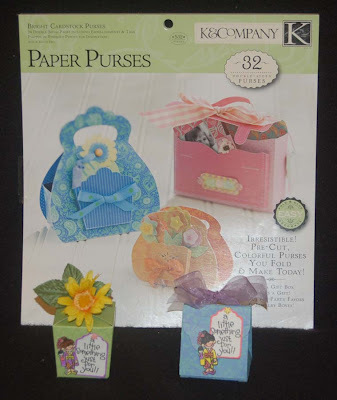 Awhile ago I purchased this pad of Paper Purses (K and Co.) from Ben Franklin Crafts. I like this product because it has two of every purse and each one is a reversable coordinating print. Plus the purses are easy to pop out and assemble. They come with pop out embellishments too. Some of the purses are tiny and so I thought they would pair well with the Dandelion Design Girls' Day rubberstamp. The decorated boxes are perfect for that little something to bring joy on Girls' Day.....jewelry? The larger paper purses are big enough for a gift card or some treats. I think if you don't have a die cutting machine or if you want to speed up your crafting, you will enjoy this K and Co. paper product. 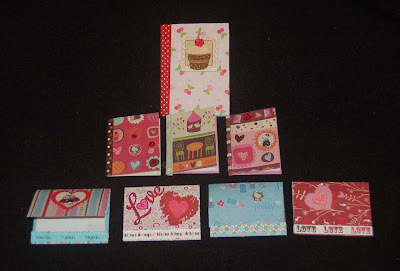 (There are other paper pads with different styles and colors of purses.) Thanks for stopping by to read my blog. I appreciate your readership and comments. According to Japanese tradition, Girls' Day is the third day of the third month. That means it's only a couple of weeks away. 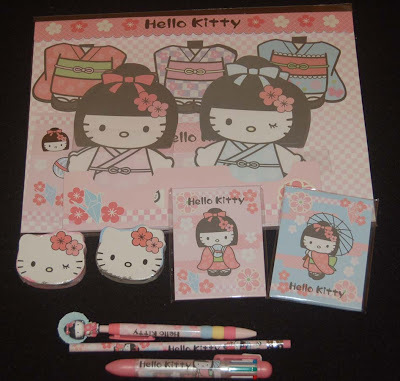 I discovered these adorable Hello Kitty Girls' Day items at Ben Franklin Crafts and I thought you might want to get them for your special little girl (or big girl). I think the big letter set is especially unique because the kimonos are the writing paper and they are supposed to be used to dress the doll. It's hard to tell from the photo but the white heads are actually towel tablets that expand into a wash cloth when soaked in water. The sweet pink and blue packets contain envelopes which could be used for a variety of craft projects (mini-albums, gift card holders, etc.) Anyway, thank you for stopping by and reading my blog. I hope that you'll visit Ben Franklin Crafts soon and start planning your Girls' Day celebration. This was my Valentine's Day gift to myself. I made it using components from the Ben Franklin Crafts bead department. (For a detailed look at the necklace, click on the photo.) The center focal heart is from the Symbolize line. The glass hearts are ones I purchased at the store whenever I saw a pretty one. The chain is also from the Symbolize collection and the pink and purple cords are silk. The brass heart charms were purchased years ago from BFC but I'm sure you can still find them as they are very popular now. You might even scavange for them in thrift stores. I made the necklace a little too short to slip over my head easily (maybe I have a big head LOL) so I will fix it by adding a clasp in the back. The charms were attached with jump rings and the glass hearts were fastened to the small brass chain with head pins. It's fun to make a free spirited necklace like this because other than the heart theme, anything can be added and will probably work. 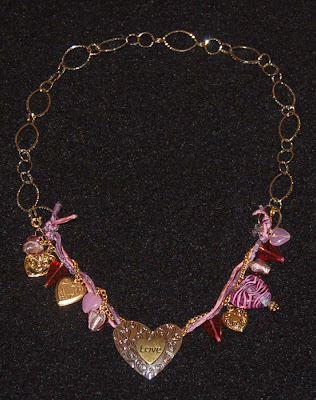 No need to save a necklace like this only for Valentine's Day......spread your love every day! It was a quiet day and I didn't even cook anything special....no desserts....maybe that's better for heart day! I did craft one last card. (Click on photo to enlarge it.) I cut out out the cupcakes from leftover wrapping paper (recycle, please) and ran them through the Xyron sticker maker and stuck them on a white card that slips into the red striped card. There are lots of cupcake stickers that could be used and embellished lavishly. The card blank was a pre-made one from long ago but should be easy to replicate. I used an EK Success edge puncher to make the white card prettier. Next I used a clipper to cut a Valentine plant marker (bouquet message holder?) (from Ben Franklin Crafts) to the length of the card. I sanded the rough end of the marker and tied a ribbon to it. Besides being decorative, the plastic piece can be used as a bookmark by the card recipient. I hope you'll try to make a card like this using other themed plant markers (St. Patrick's Day, Spring or Easter) Even though it's Valentine's Day evening I want to wish all of you a Happy Heart Year! 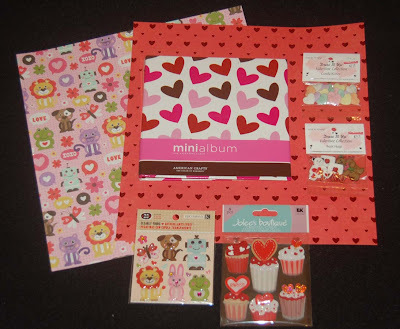 Oh the shipment of K and Co. Valentine items arrived late but they were so cute I had to show you the paper and stickers, plus I found some new Dress It Up Valentine buttons, Jolee cupcake stickers, and some fabulous American Crafts 6x6 albums (perfect for storing my finished Valentine cards). You might be wondering why I'm still stocking up on Valentine stuff now......to get a jump on next year of course! I plan to check out BFC to see if any of it goes on clearance after Valentine's Day.........see you there! 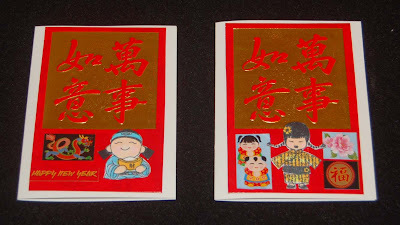 I purchased some Chinese stickers, rubber stamps and red money envelopes from Ben Franklin Crafts with the intent to make something to celebrate the Chinese New Year. However, I didn't realize that this year both Valentine's Day and the start of the Chinese New Year were both on the 14th of February. I've already shown lots of Valentine crafts so I thought that I should post at least one Chinese New Year project before the 14th. The red part of this card is actually a traditional red money envelope that Chinese parents give to their unmarried children. I folded the top down and taped it in place so that it can be filled with money and yet serve as a dramatic card front. I stamped the Hero Arts designs (Prosperity Smile and World Dolls) on white cardstock, colored them, and cut them out. I put some 3L black foam squares behind the cutouts to raise them off the card. The stickers and red envelopes are from Amscan and the white linen card is a Paper Arts product. These cards are so easy to make that you can produce a lot of them and mail them out instead of the expected Valentine's Day card. Even if you aren't Chinese, you can fill the envelope with a gift card, coupons, movie tickets, etc. Have a Happy and Prosperous Chinese New Year! So many bloggers have shown their cute decorated mini tablets that I decided to give it a try. (See the top cupcake one.) It turned out well but since I carry a rather small purse, it was a little bulky. I really needed a teeny tiny notebook with just a few pages to scribble down an e-mail address, book title, or cell phone number. On the day that I was working on the first tablet I also misprinted a stack of papers because I wasn't watching the printer. I hate wasting paper so I decided to cut up the used computer paper into 2-1/4"x3" for the pages of a mini notebook (only the unprinted side of the paper will be used for note taking). I made a cover from scrap printed cardstock (4-5/8" x 3-1/4") and 7/16" to 11/16" wide ribbon remnants (to cover spine). I simply folded the cardstock over the papers and stapled them in place. Then I used the ribbon to cover the sharp edges of the staples so they won't snag anything in my purse. I also made matchbook style mini notebooks using 3-1/4" x 5-1/2"pieces of cardstock and gluing ribbon over the staples on the front and back. I like that I was able to repurpose the printed computer paper, scrap cardstock, and ribbon remnants. Decorating the mini notebooks was fun too because I finally found another use for those tiny Hello Kitty stickers. I used Scribbles to highlight some of the images on the printed cardstock covers and added some rub-on designs. These mini recycled notebooks would be good to include with your greeting cards or use as a gift tags. 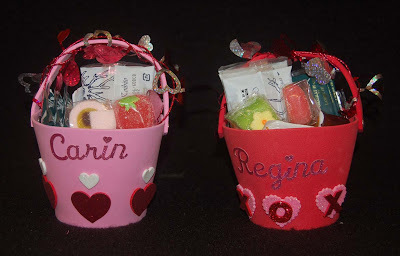 The second photo is the two -part treat holder made from the Sizzix scallop bag die that I said I would finish and show you. 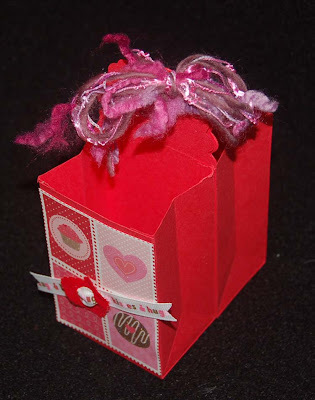 It is a version of the three -part Valentine treat holder (made using the same die) that I showed you on a previous post and explained in our website (http://www.bfcraftclub.com/) projects. This treat holder could be adapted to an Easter theme. This is another inexpensive quickie Valentine project. In just a few minutes you can craft these simple foam treat buckets that are decorated with stickers (MS letters and Nicole Crafts glitter foam) and sparkly heart garlands (on the handle). There are a few more days 'til Valentine's Day, but I know that you still have time to create something fun to make someone's day brighter. Do you need to make lots of treat bags but you don't have a lot of money or time? Well, check out the Nicole Crafts mini-polypropylene undecorated bags. For only $1.99 at Ben Franklin Crafts, you can purchase a set of three bags in white, pink, and red. 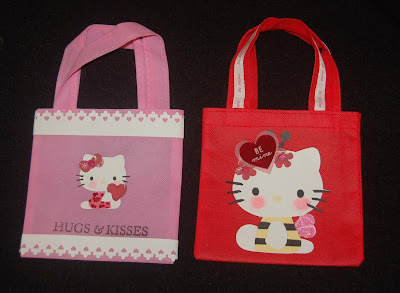 I used my Hello Kitty Sizzix dies, Martha Stewart border punch, Hero Arts stamp with fabric craft ink, ribbons, scrap paper, and other embellishments to easily and inexpensively decorate the bags. The total cost of each bag was under $1. Hurry up, you still have a week to make and fill up bags for all your sweeties! 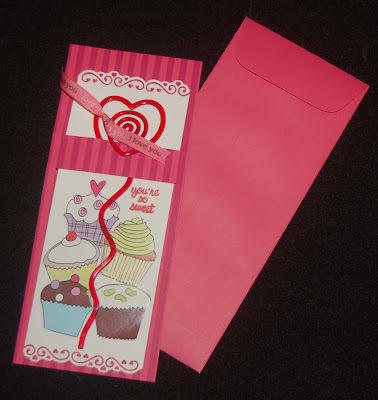 You could even use the bags as envelopes and hand-deliver special homemade cards. Thanks for visiting my blog! I'll be posting a few more Valentine's Day ideas in the next week so I hope you'll come back again. Congratulations to FAY, the winner of our Craft Lover's Valentine Contest! Fay, please e-mail me (contact@bfcraftclub.com) your mailing address and I will send your prizes to you. Thank you to all of you who entered our contest and shared your comments about your favorite craft. Now we know that there are many of you who love to craft cards, make jewelry, paint, sew, and work with yarn. We will continue to try our best to stock the supplies you need at Ben Franklin Crafts. Valentine's Day is less than two weeks away, but you still have time to create sweet gifts for classmates, teachers, teammates, co-workers, and others who bless your life. 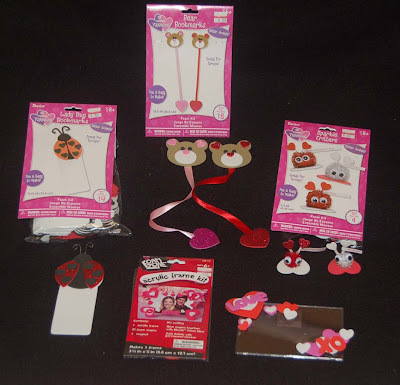 Nicole Crafts kits (sold at Ben Franklin Crafts) are the solution for easy and economical Valentine projects. In less than an evening you can make dozens of cute bookmarks, picture frames, magnets, etc. Most of the kits cost about $3.99 and make approximately 9 to 18 items each. The magnetic picture frame kit makes one and costs $1.50. I assembled the kits with Fabri-Tac glue, which I feel is a safer choice than a hot glue gun. All the kits that I tried yielded excellent results with the exception of the googly eye pompoms which I feel came out slightly smaller (but still cute) than I expected based on the photo on the package. A scout troop or classroom of elementary students would be thrilled to make any of these gifts for their loved one and you'll be thrilled at the reasonable price and wonderful results. 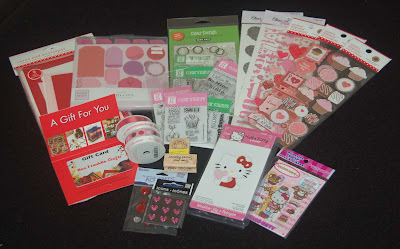 Don't forget to check back tomorrow for the results of our Valentine's Craft Lovers Contest. Free Stuff! Free Stuff! Free Stuff! Now that I have your attention, here's how you can win all these free Valentine goodies. By Feb. 3, 2010 (midnight PST) leave a comment on this blog telling me what you love to craft. One winner will be randomly chosen from all the submitted comments and announced by Feb. 5, 2010. Please leave a more specific name than "anonymous" to distinguish your name from other entries. You will have to send me your home address if you are selected as our winner so that the prizes can be mailed to you. Pictured below are the prizes (including a $25 gift card to Ben Franklin Crafts) we are giving away in the Craft Lover's Contest. Okay crafters, this is an easy contest so post a comment now and check back to see if you are the winner!